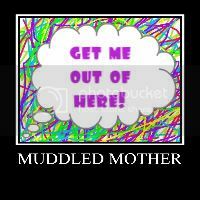 A Muddled Mother: Feeling Desperate? Desperation is certainly an emotion that is felt by humans more than once throughout our lives. It isn't solely a depressed emotion, or a poor emotion, or a lonely emotion. Desperation thwacks us all--ALL. Perhaps desperation feels worse when things, the big things, are what's causing it. Perhaps someone has lost a family member or a whole family. Perhaps a single mom can't pay the bills or feed her children. Perhaps a beloved job has been lost. Perhaps a family home has burned to the ground, or someone has received news of a terminal illness. These big things; family, money, jobs, homes and health are usually what give us comfort and keep us going. However, if these things are all of a sudden taken from us somehow, I am sure--I know--it would feel like we've been set upon a surf board on a 80 ft. wave with a massive rip current underneath. Nothing on which to lean. So what would help us keep our balance? This is a question I have been pondering over the last week. There are so many who don't have the safety and love and security of family, work and home and health. What keeps them going when the big things are gone? What would keep me going if those big things suddenly disappeared? More importantly, besides the big things, what are the little things I would miss if I suddenly disappeared? So for the last 48 hours, I have been paying attention to my days, my hours, my minutes, my split seconds. I took stock of my life's little joys, and what I've found is that when putting my mind to it, there are so many wonderful seemingly insignificant things in this world that bring a sense of satisfaction and even happiness that I have never really even considered. Take yesterday for instance, I made homemade spaghetti sauce with meatballs. As I was preparing the food, I imagined never being able to do that particular task again. What I found was that there were so many things that I'd miss: the smell of garlic on my fingers after dicing, the tangy taste of sauce on my tongue while sampling, the pure feeling of satisfaction when a recipe comes together, the super smells that waft through the house when using a crock pot. All of these I'd miss if I were suddenly gone. Last night, after a taxing day with my daughter, my husband gave me a foot rub and while that is one of life's BIG pleasures, I tried to break the act down into the small things that just make life spectacular. I learned that even without a sweet husband, there were amazing things about my feet (yes I said my feet) and that rub that I'd miss if I suddenly disappeared. Don't you just love the feeling of relief you get when you finally sit down after a long day and kick off your shoes? What about rolling your ankles in circles as they rest on an ottoman or flexing and pointing your toes? 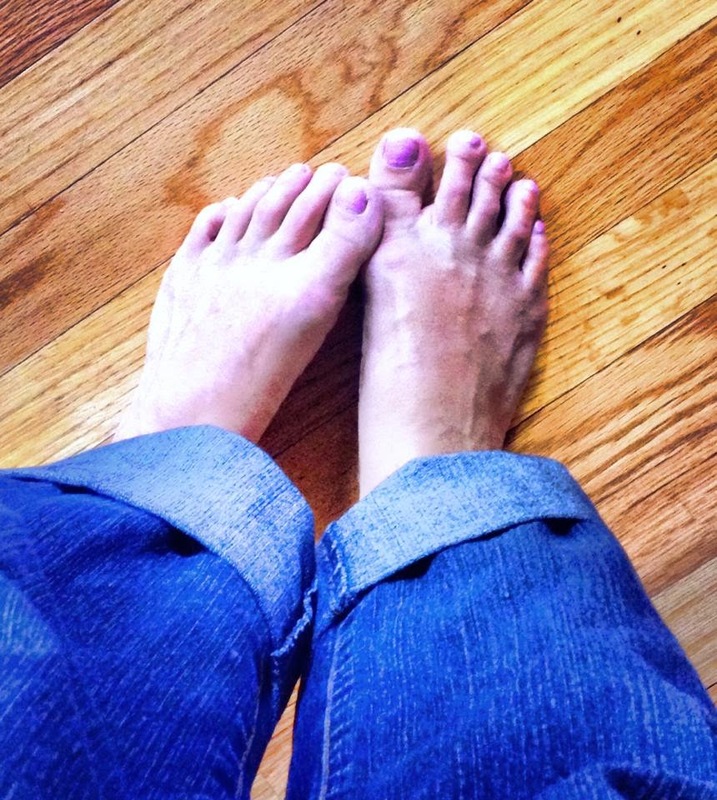 I found I loved to sit with the left side of my left foot resting between my big and second toe on my right foot. The cotton-candy smell of the lotion that my husband uses I realized is quite decadent and certainly makes me feel happy. Even its consistency is one that I never really stopped to think about. It isn't that runny lotion that one buys in the drug store, but the kind that feels like frosting in your hand and stands at attention before getting applied to your skin. Lotion and feet--life's little pleasures. Whodathunkit? This morning, when feeding the dog, once again I imagined what it'd be like if I couldn't do that anymore. I instantly knew that I'd yearn for the clicking of the dog's nails on the ceramic floor produced by Charley's joyful reindeer-type leap. Even the sound of the kibbles hitting his bowl makes a sort of music. And even now, sitting here writing away, I am thinking about the miracle of my brain and how it sends light speed messages so that my fingers move easily along the keyboard and that I love the way it feels when my nails click away on each key's smooth surface. Currently there's a bird in my front yard cawing with a chorus of crickets behind it and a little breeze is billowing my sheer curtain through the open windows. All of this is usually background noise and distraction but today I hear it differently. I see it differently. These are earth's tiny miracles that I have taken for granted for so long. I am sure without a shadow of a doubt that I'd miss all of this if somehow it or I were to disappear tomorrow. The small things can sustain us a bit if we let them. I know, I do know that life is hard, the news is bleak,and the world seems to be crumbling. But perhaps...perhaps, if we can zoom in on what once we thought was the mundane like cooking dinner, feeding the pet, sitting on a couch in our living room, lotion, and yes, even feet, we may realize that there is so much to life that we can lean on when standing on that shaky surfboard. There are many things we'd miss if we disappeared into the ethers. So when desperation knocks on our door some bleak day, when life's BIG things trouble or leave us cold, you and I can try and lean on the little things, the everyday things that I now know are not just noise, and details and things that I completely ignored, but instead are small miracles and necessary joys without which life just wouldn't be the same. After doing some thinking, I'd love to have you add what small things you'd miss if you could no longer experience them. Let's help each other appreciate life's small miracles! The smell of clean crisp sheets n the comfort of climbing into bed.